Aldgate library, in the Calcutta House building, is based in an area of London steeped in social and political history, and has inspired artists, writers and photographers for centuries. Currently on at Gallery 46 in Whitechapel is a photographic exhibition ‘A Sort of Home: 1970′s Whitechapel’ by David Hoffman, documenting life in 1970′s Whitechapel squats. The exhibition is on until August the 15th. The 1970′s were significant in Whitechapel, and 2018 saw the 40th anniversary of the ‘Battle of Brick Lane’, when the racially motivated murder of the Bangladeshi textile worker Altab Ali (whom one of our local parks is named after) in the area bought tensions to a head and saw thousands march to Downing Street in a Bengali-led demo. We have a collection of books about the area in Aldgate library, but to find further information on local history, most London boroughs have local history libraries, where they keep archives and records as well as books on their local area. Tower Hamlets local history library is on Bancroft Road, although they have much available online as well, including many images of Tower Hamlets. Or how about oral histories? For example in oral histories of the Bengali East End you can listen to three people recollecting life in the borough in the 70′s and 80′s, including the murder of Altab Ali. Tower Hamlets have also produced a downloadable book ‘The Bengali East End’ as part of an ongoing project to fill gaps in its collections and reflect the histories of Bangladeshi residents. This is of personal significance to me, as it features my mother’s cousin Caroline Adams, who did a lot of work with the Bangladeshi community in Tower Hamlets and sadly died in 2001. 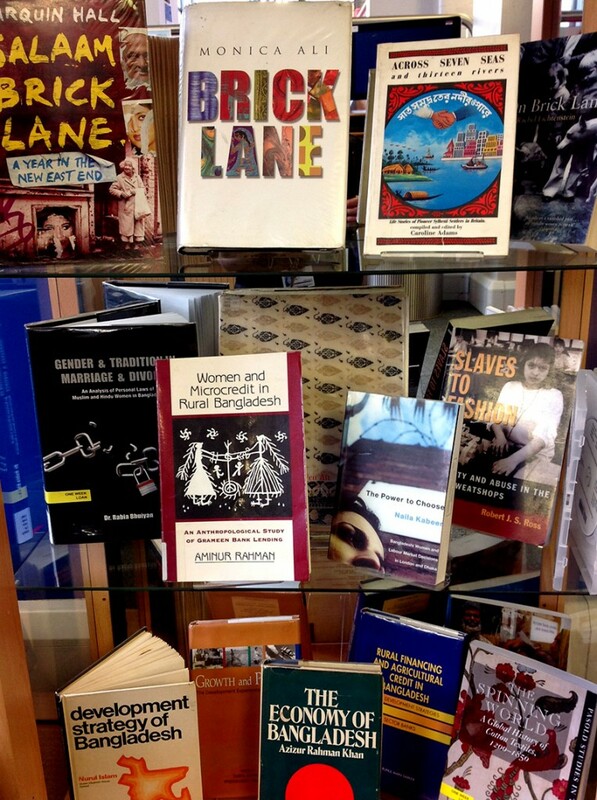 I only came across this book whilst doing research for this blog post, and the book she wrote ‘Across Seven Seas And Thirteen Rivers: Life Stories Of Pioneer Sylheti Settlers In Britain’ is also part of our display in Aldgate library on Brick Lane. This entry was posted in Digital online archive, events, Exhibitions, External archives and libraries, Uncategorized and tagged "art history", East London, history, local history, photography, whitechapel. Bookmark the permalink.